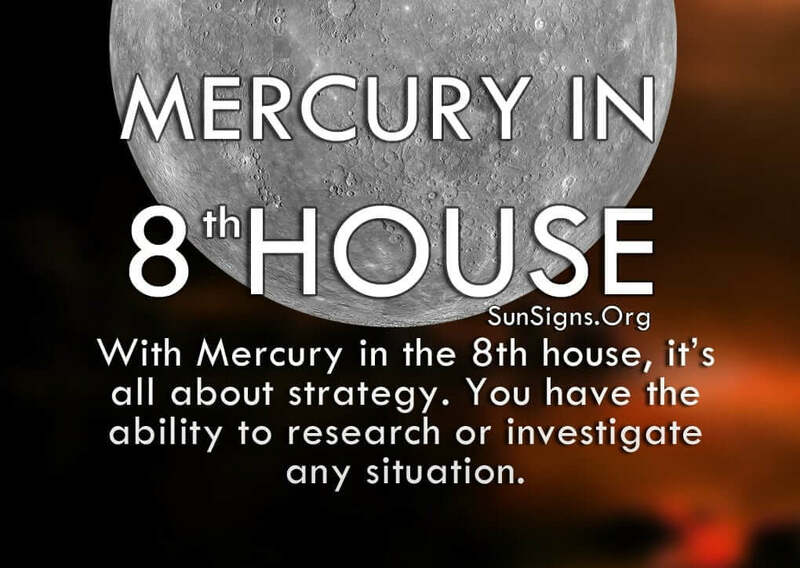 With Mercury in the 8th house, it’s all about strategy. You have the ability to research or investigate any situation to determine what’s really going on behind the scenes and figure out the best course of action. And because of your incredible psychic abilities, you are usually correct in your decision. Planet Mercury represents logic, reasoning, communication, interaction and practical decision-making skills. In the 8th house you are very straightforward during your discussions. You can analyze a person or event very quickly and convey the necessary information quite effectively to anyone involved. You have strong opinions and aren’t afraid to voice them, no matter what the consequences. Because people with Mercury in 8th house are so mysterious, people tend to flock to you out of curiosity. They have a tough time reading you and they never know what you’re going to say. Many people find this intriguing so they try harder to get close to you. And your confidence makes them feel sure that they are making the right decisions in doing so. You present yourself with authority so people don’t question your motives. Use your ability to communicate plans and ideas to your advantage. Find a way to let people in on your terms. Once you see that this isn’t such a bad thing, it will be easier for you to expand your social circle. But the one area where the eighth house Mercury are guarded is your emotions. While you speak your mind, you keep your heart to yourself. This is good when you need to keep a poker face to avoid revealing too much. When it comes to your relationships, however, it’s not always the best solution. Your partner is often left wondering what’s going on inside your head, and that can make them feel insecure. You have to learn to trust people and let them into your world once in a while. It will help to strengthen all of your close relationships. But they do start to wonder what’s going on if you avoid answering everything they ask you. Try to lower your inhibitions when it comes to revealing things about yourself. Once you get to know someone well, it’s only fair that they get to know you in return. While you feel it’s easier to get hurt that way, others see it as you refusing to form true relationships with anyone. (Get your zodiac compatibility analysis with your partner). The reason people with Mercury in 8th house have trouble communicating their feelings is because you experience things so much deeper than other people. You believe everything has a purpose, and you are constantly searching to discover what it is in every case. While others walk by something or someone without noticing them, you see everything and everyone there is to see. You are always looking for hidden meanings and feel there is so much more to the world than we realize. Because of this, you often have difficulty expressing the intense emotions you experience on a daily basis. And that prevents you from truly revealing yourself to someone, even someone who has demonstrated their love and loyalty. Only in the most intimate moments are you able to let yourself and your feelings free, and you choose a very small number of people for that display. Sometimes it’s only through physical release that you’re able to truly express the chaos happening inside of you. And only a few people can handle that intensity.